The year 2018 went out with a bang where home interiors are concerned, and the new year has brought with it some super-cool ideas for what looks good. 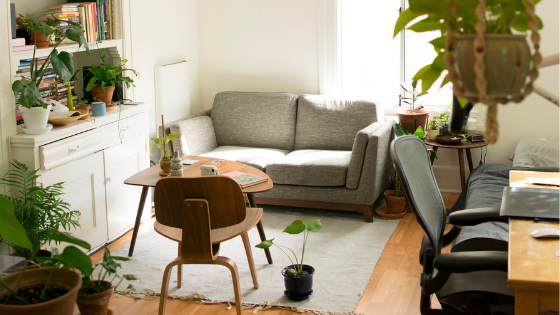 From minimalist furnishings to cushy luxury touches that are about as extra as it gets, here are some interior design trends for 2019 to consider integrating into your Chicago apartment. Eye-catching trends, fascinating furniture situations, and new twists on old faves — 2019 has a lot in store for those who love to align their interiors with what is trending. Here are three easy-to-implement trends for the new year. Remember those miniature palms, elephant ears and giant ferns that used to hang around your home when you were a kid? Those gorgeous green implements are making a huge comeback in 2019. Adding greenery and live plants to your apartment helps bring out this certain air of nature inside your home, which falls in line with some minimalist designs of 2018. Pick up a potted fern, add a herb garden to your window sill, or consider picking up a faux version of plant life if keeping things alive is not your thing. Perhaps one of the most unexpected twists in interior design for 2019 is the return of those bold jewel tones that exude a regal appeal. Deep ruby reds, navy blues, and even burnt orange are showing up in new furnishings, floor coverings and decorative objects. Even with white walls and muted flooring, these jewel tones pop with uber personality. If you want to give a room an entirely new personality, paint is the go-to thing to use, but you don't necessarily have to paint the walls to make a difference. Add a fresh coat of color overhead and your room becomes something else entirely. For example, you could slather a coat of charcoal grey on the ceiling over the living room and it instantly becomes more demure and elegant. Just a few alterations are all it takes to make your Chicago apartment appear more trendy. Reach out to us at The Montrose to find out about available apartments you can call home.